MAEOE works with a wide range of sponsors, partners and other organizations to support our mission, implement our initiatives and extend our impact. These partnerships are important for today’s youth become tomorrow’s stewards of the environment. A sponsorship opportunity with MAEOE can raise your "green" profile and help increase MAEOE's programming throughout the state. 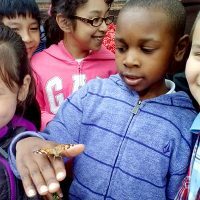 Anacostia Watershed Society (AWS) is coordinating an important partnership of organizations to support Prince George's County Public Schools environmental education curriculum. The Chesapeake Bay Program (CBP) is a unique regional partnership that has led and directed the restoration of the Chesapeake Bay since 1983. The goals of MAMI are to: educate the public about the Monarch Butterfly; propagate and increase the availability of milkweed species and pollinator species for restoration efforts; create and restore Monarch Butterfly habitat; inventory the existing milkweed populations; and create “no mow” zones. MAEOE and NWF have partnered to support schools as they become Maryland Green Schools. MAEOE works with facilitators throughout the state to provide PreK through grade 12 teachers with multi-disciplinary instructional materials, professional development, and other resources to help youth gain awareness and knowledge of the natural and built environment, their place within it, as well as their responsibility for it. Learn about sponsorship opportunities that align your organization's goals with the MAEOE mission. And meet some of our currently active partners and details of their projects.